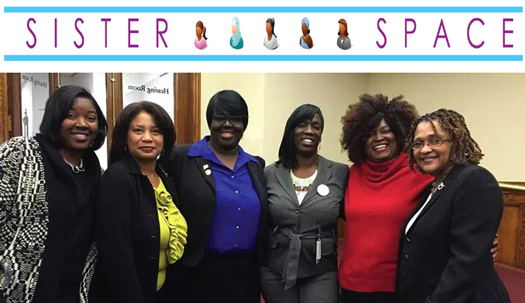 (L-R) Alexandria Givan (Professional Athelete /Educator), Angela Carter (Web Producer, NH Register), Deborah Wright (West Haven Police Commissioner), all Zetas; Jeanette Morrison (Alder-woman & State of CT Social Worker), an AKA; Babz Rawls Ivy (Editor of Inner City Newspaper) a Delta and Tanya Hughes (Director of CHRO), an AKA, all participated in Sisters of Today and Tomorrow Leadership Conference for Girls in New Haven, Connecticut, where they took part in the Sisters Circle, an inter-generational dialogue of women and girls. #WeMatter. 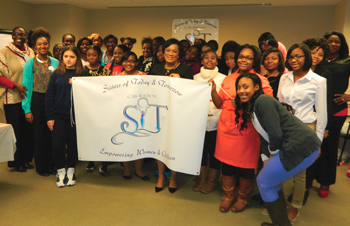 New Haven, Conn. - Sisters of Today and Tomorrow (SOT) took its conference to another level of transforming the lives of girls and the women who raise them, when it hosted its 2nd Leadership Conference for Girls in New Haven, Connecticut, in late December. 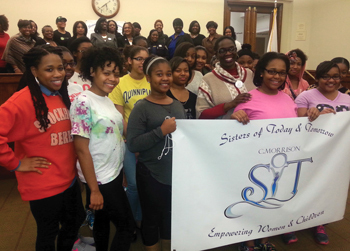 Sisters of Today, all professional women, throughout the State of Connecticut (back) become a Circle of Mentors for the Sisters of Tomorrow, girls from Greater New Haven (front). The conference included, a judge, mayor, alder-woman, civil rights director, police commissioner, police officer, 7 figure income entrepreneur, health and fitness instructor, educator, journalist, radio personality, two college students and more, all there to play a part in empowering young girls throughout the City of New Haven, Connecticut. 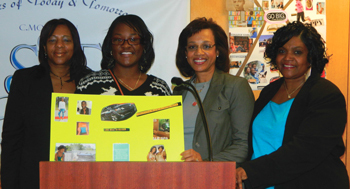 Dominique Ratchford a senior at James Hillhouse High School, shows off her Vision Board, that she created during the conference, with workshop facilitators Tammi Bolden and two dynamic women from Windsor, Conn.
From the vision board party to the Sisters Circle, the girls and women shared and learned from one another, creating an inter-generational circle of love and open communication. Sisters of Today and Tomorrow New Haven surrounds Mayor Toni N. Harp, the first Black woman elected mayor of New Haven. Sisters of Today and Tomorrow helps to transform the lives of young girls, ages 9-18, and the women who raise them. The organization will start monthly online mentoring in February, 2015 and will host its 10th annual Women’s History Month program, Saturday, March 7, 2015, in Atlanta, Georgia.